These ionic humic minerals are from a fresh water source giving them the lowest molecular weight of all humates. Their small molecular size makes them immediately able to pass directly into cells on contact. Daily use will assist the body in the natural manufacture of glycoproteins that provide immune system and hormone support, and provide strength to cell membranes. 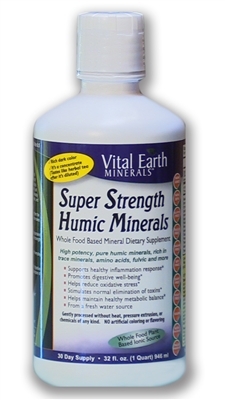 Humic is a powerhouse for supporting the normal elimination of everyday toxins from the body. Humic promotes optimal GI tract health and assists healthy digestive function by aiding absorption of key nutrients and promoting normal enzyme production.